Mormon Row is an area in Grant Teton National Park that features several buildings that remain from an early 19th Century settlement of a few Mormon families. The most famous structure is Moulton Barn, but this structure known as the Pink House is fairly well known as well. One of the facts of life as a photographer is that when you go visit one of these famous locations it is nearly impossible to create a truly unique image. Of course every image is unique in its way, but essentially most such places have 1 or 2 iconic looks that you take because they are famous and iconic for a reason, and your attempts to shoot these subjects from different perspectives usually generate shots that are less obvious , but are so for a reason. So I was pleased to note that a google image search for “mormon row pink house at night” does not actually show at shots of this structure at night. 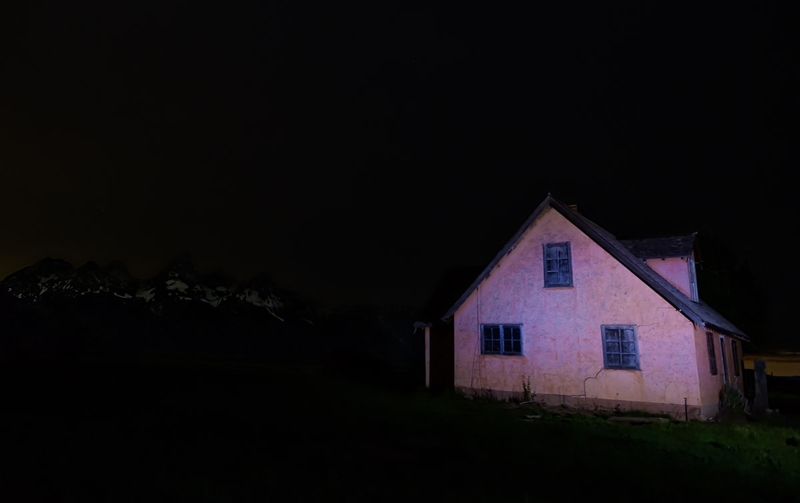 A search for images of “mormon row pink house” generates may images of the house, but no variants of any such search can lead me to another one taken at night. I have no illusion that this is the only one on the web. It is in fact not an entirely esoteric to shoot an iconic loction at night. But I suppose it is still a bit unusual if nothing turns up on google. A final note: depending on your monitor, this image might look rather dark, murky, and not all that interesting. My Mac screen is well calibrated for color, but no matter what I do regarding brightness I find that my darker mages never look as good on some other computers, even when the brightness is turned up to their max and my Mac is set at 30% or so. I’m not sure how best to address this, and my apologies if that is how it looks for you. It’s not purely a Mac thing by the way – some other computers render it just fine.